Thin Red Line developed and supplied 20 full-fidelity inflatable pressure shells of up to 320 cubic meter volume for Bigelow Aerospace. 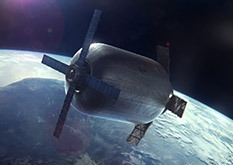 Thin Red Line designed, engineered and manufactured the pressure restraining hulls of Genesis 1 and 2 (launched 7/2006 and 6/2007 respectively), the first spacecraft on orbit successfully incorporating large volume, high-stress inflatable architecture. Teamed with Paragon SDC, Thin Red Line performs verification and validation studies for its innovative inflatable UHPV technology. As concept development for the NASA Flagship RFI, “Inflatable Module Mission”, this Lockheed Martin image shows Thin Red Line UHPV-based habitat architecture docked to International Space Station Node 2. 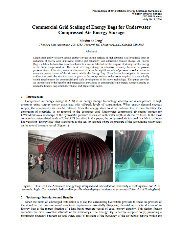 Design and fabrication of a one-third scale habitation pressure module using Thin Red Line’s proprietary UHPV architecture. Virtually unprecedented, UHPV load paths are determinate—leading to unsurpassed predictability of structural performance and scalability. Mathematically verified as mass optimized architecture, UHPV currently offers higher specific strength than competing alternatives. 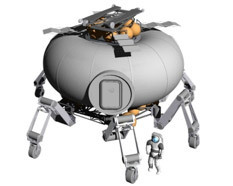 As inflatable habitat specialist, Thin Red Line Aerospace supported expandable architecture concept development for the Boeing MFHE (Minimum Functionality Habitat Element) study. 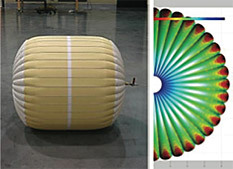 Teamed with CFD Research Corp., Thin Red Line is developing an integrated inflatable decelerator for planetary entry. Scalable to accommodate payloads of over 10 metric tons, the system includes thermal protection and load bearing attachment for guidance and control (G&C) hardware. 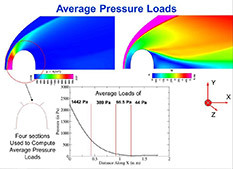 Integrated fluid-structure thermal simulations are conducted with CFDRC's validated tools to provide insight into aerodynamics, material stress, and localized heating effects, and to verify and optimize design variables. Study of integration methods and effectiveness of various deployable radiation shielding approaches in the context of Thin Red Line inflatable habitat architecture. The integrated, flexible-deployable architecture offers modular radiation shielding with significantly reduced mass and encumbrance. Deployable MMOD shield test article for Bigelow Aerospace, for launch load vibration testing at NASA Jet Propulsion Laboratory. 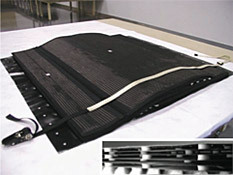 The ballistic shielding effect of the expandable structure is largely optimized by deploying substantial space between successive parallel shielding layers to allow conical dispersion of impact debris clouds. 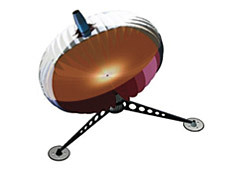 Thin Red Line’s integrated deployable shielding design incorporates multifunctional material layers providing optimized spacecraft MMOD, thermal and radiation protection. Besides protection for habitation architecture Thin red Line’s design is particularly relevant to orbital propellant depots and cryogenic storage. Teamed with Technology Applications Inc., Thin Red Line’s inflatable UHPV technology is investigated as powerful alternative to cryogenic COPV’s. 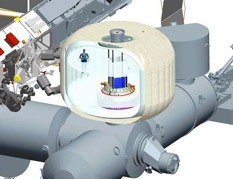 UHPV’s extreme simplicity permits incorporation of a much broader spectrum of corrosive content (LOX, LH2, LCH4, etc.) compatible liner materials. 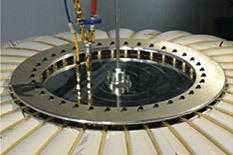 For propellant depots UHPV can be packaged for launch, filled in-situ, and repeatedly depleted to almost zero residual. Teamed with Sierra Lobo, Thin Red Line led concept development for high pressure helium containment to volumes of 500 cubic meters using Thin Red Line’s proprietary UHPV (Ultra-High Performance Vessel) inflatable architecture technology. Thin Red Line’s design is the highest strength fabric containment structure ever contemplated and is applicable to an exceptionally large range of terrestrial and space exploration applications. Large scale ability to store surplus energy for use during periods of high demand is a formidable asset in reduction of energy cost, improving electric grid reliability, and addressing climate change. 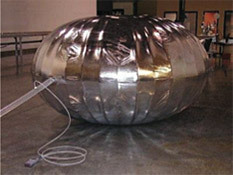 An Energy Bag is a fabric balloon-like vessel anchored to a sea- or lakebed for the purpose of storing surplus energy in the form compressed air. 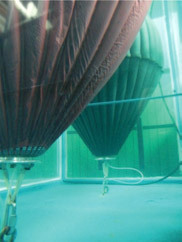 This mode of energy storage is attractive primarily because the passive pressure force of the deep water environment takes on the significant role of pressure vessel structure to maintain pressurization of the air stored within the Energy Bag. Upon further investigation it becomes evident that particular attention must be given to the storage volume and pressure required to economically satisfy requirements for commercial grid scale development of this novel technology. This paper provides an introduction to the benefits and prerequisites pertaining to commercial scale energy storage capacity as related to Energy Bag structure, volume, and deployment depth. Inflatable underwater containment facilitates highly efficient storage of offshore wind, tidal and wave power as compressed air (> 30 MJ/m3 at 700 m depth). 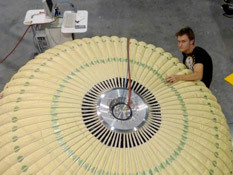 Attached to the seabed, the inflated vessels would expel the depth-pressurized air to power turbines generating electricity during periods of high demand or intermittency of supply. Thin Red Line Aerospace is supporting Prof. Seamus Garvey’s visionary ICARES Project at University of Nottingham, UK, with design and fabrication of undersea vessels to 50 m3. Project efforts include concept development for volumes to 6000 m3. Thin Red Line’s UHPV technology facilitates the lowest mass and encumbrance airbag system of any competing design. UHPV performance predictability during a rapid compression event can be characterized and validated analytically for a broad range of impact attenuating applications without unduly complex and/or extensive testing. Thin Red Line’s innovative design permits attenuation scalability without reliance on burst disc calibration. Teamed with Infinia Corp. under an OSD contract, Thin Red Line Aerospace is applying its inflatable UHPV technology to solar concentrator architecture to support tactical energy production. Taking advantage of UHPV’s geometric determinism, Thin Red Line manages an in-house R&D program for design development of large aperture inflatable antenna systems. The exceptional mass efficiency of Thin Red Line’s proprietary inflatable technology extends the mission envelope of planetary and terrestrial high altitude systems by providing the lightweight structural elements needed to develop large surface area lifting bodies. Besides HAA technology for Earth atmosphere surveillance applications, Thin Red Line’s acid resistant and Montgolfière concepts respectively target NASA objectives Venus and Titan. 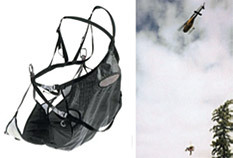 Thin Red Line has a long history of design, testing, and field application of critical use rescue, aviation, and tactical personal protection systems. Thin Red Line’s work at the leading edge of fabric and film structure engineering demands commensurate intimacy with the latest advanced materials. 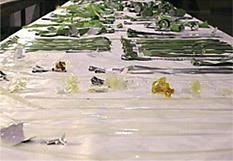 The most recent fabrication technologies are exploited to generate a finely tuned symbiosis of material and structure. © 2011 Thin Red Line Aerospace. All rights reserved.